PHILLIP J. COOPER is Gund Professor of Liberal Arts at the University of Vermont. A leading authority on public law, he is the author of numerous articles, books, and other materials on administrative and constitutional law, public policy, and public administration. He lives in Burlington, Vermont CHESTER A. NEWLAND is Duggan Distinguished Professor of Public Administration at the University of Southern California. He has served as national president of American Society for Public Administration (ASPA), editor-in-chief of Public Administration Review, and director of the Federal Executive Institute. He is a member of the National Academy of Public Administration. He lives in Sacramento, California and Washington, DC. 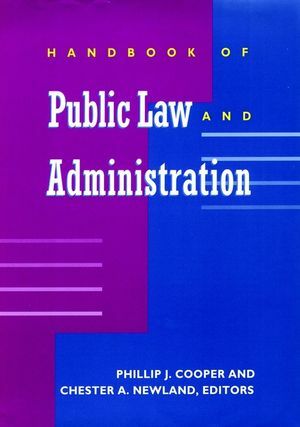 PUBLIC LAW FOUNDATIONS OF PUBLIC ADMINISTRATION. Faithful Execution of the Laws, Rule of Law, and Autonomy of Public Administration (C. Newland). Public Law and Public Management: A Conceptual Framework (C. Kerwin). The Importance of Public Law: New and Old Paradigms of Government Management (R. Moe). PRACTICAL FRAMEWORKS OF PUBLIC LAW AND ADMINISTRATION. The Law-Politics Dialogue: It's Not All Courts! (L. Fisher). Legal Authorities and Administration Actions (R. Gilmour & H. Sellers). Techniques of Legal Interpretation and Why They Matter (H. Ball). Public Law as a Set of Tools for Management (P. Cooper). WHO HAS THE POWER AND WHERE ARE THE LIMITS? Separation of Powers with Checks and Balances: The Search for Workability (C. Newland). Who Does the Work? Federalism and the Changing Nature of Intergovernmental Relations (L. O'Toole). Local Implementation of Federal and Stat Programs: Preemption, Home Rule and Federalism (B. Cigler). ADMINISTRATIVE LAW AND TODAY'S STREET-LEVEL CHALLENGES. Executive Direct Administration: The Importance to Public Administration of Executive Orders and Proclamations (J. Utter & P. Cooper). Ordinances, Statutes, and Democratic Discipline: A Local Perspective on Drafting Laws (D. Corliss). The "How Much Process Is Due?" Debate: Legal and Managerial Perspectives (H. Rainey). CIVIL SERVANTS, SUPERVISORS AND CHANGING LAW. The First AmAndment and the Public Sector (D. O'Brien). Constitutions, Statutes, Regulations, and Labor Relations: Dispute Resolution in a Complex Authority Mix (N. Riccucci). Privacy and Integrity Testing for Public Employees: Searches, Drug Testing, Polygraphs, and Medical Examinations (N. Cayer). The Raging Debate Over Equality: Nondiscrimination, Affirmative Action, and the Civil Rights Act (M. Kurtz). Gender Issues in the Workplace: Compensation, Reproductive Safety, Family Obligations, and Sexual Harassment (M. Guy & S. Calvert). Public Law in the Changing Civil Service (L. Nigro). Law versus Ethics (W. Richardson). Open Government and Freedom of Information: Fishbowl Accountability (L. Feinberg). Problems of Discretion and Responsibility: The Debate over Tort Liability (B. Jenkins & R. Kearl). Court Involvement in Operations of State and Local Institutions: Injunctions and Other Remedies for Maladministration (P. Cooper). The Balancing Act of Judicial Review: Ensuring Enough Deference to Administrators and Enough Accountability (R. O'Leary & P. Weiland). Government Lawyers: Who Represents Government and Why Does it Matter? (C. Clayton). Race, Education, and the Legal and Administrative Systems: Perpetual Tensions (C. Washington). Legal Impacts on Budgets and Finance: Anticipating Problems and Reacting to Realities (T. Lauth & P. Cooper). Legal Issues in Contracting for Public Services: When Business Does Government (R. DeHoog). Alternative Dispute Resolution in Public Administration (L. Bingham). Conclusion: Present and Future Challenges. The Future of Public Law: Public Law and National Borders (C. Wise).